This entry was posted in Receiving Immortality and tagged Christ, Gospel, health, Jesus Christ on July 4, 2014 by literalgospel. The Challenge of Your Life? Apostle Paul pulled no punches in this stark comparison between the Word of God and the conversations of people. Do you believe this scripture is an essential viewpoint to use when reading The Holy Bible? If so, you are hereby challenged to discover the meaning, worth, and intent, of your physical body according to God’s Word in the Bible. Each passage of scripture illustrates God’s intentions and commandments for your physical body. People often focus on God’s relationship with the spirit of man, and the personality, but these scriptures offer profound proof that God redeems and loves the human body as well as the spirit. These scriptures require the reader to take God’s Word at face value, without human interpretation or opinion. That is why the opening scripture says, “let every man be a liar!” Holding to the principle that God’s Word is true, you will discover an amazing revelation which concerns every person who reads this blog. Your physical body is precious in God’s sight, and everlasting life is a physical miracle which is obtainable now, today, and immediately! Would you rather live instead of die? Would you like to save the lives of your children, family, and friends? I hope so, because according to God’s Word, the act of physical death is not the doorway to heaven! Nobody goes to The Kingdom of Heaven to be with Jesus at the moment of death because Jesus is alive! Death is a curse not a cure. Death is still the wages of sin (Romans 6:23), and no lie of mankind can change that fact. 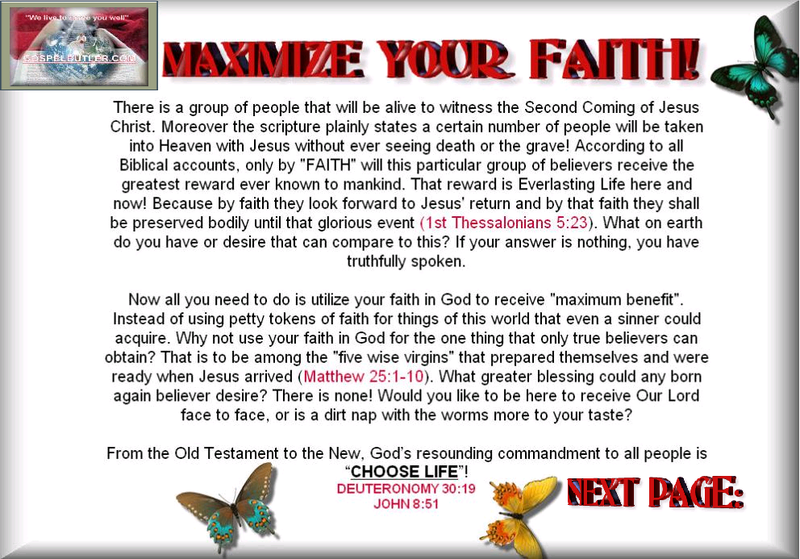 Nevertheless, death can be overcome, outwitted, outsmarted, and totally avoided, here and now, forevermore! 1st Thessalonians 4:17 proclaims, “Then we which are alive and remain shall be caught up together with them in the clouds, to meet the Lord in the air: and so shall we ever be with the Lord.” This group of people are the righteous believers who are alive on the earth when Jesus returns. Please note that they leave this earth by physical ascension not death and the grave. They are physically risen into heaven and escape the curse of death completely. This puts a whole new spin on the spiritual song, “When the saints go marching in” (literally on their feet). The question is, Do you prefer ascension over the grave? If so, this list of scriptures will ultimately introduce you to an escalated focus of faith that can only be described as, “The Challenge of Your Life.” Enjoy! This entry was posted in Receiving Immortality and tagged Christ, eternal flesh, everlasting body, Gospel, health, immortal, life, longevity, obey, power, sinless flesh, temple of God on October 29, 2012 by literalgospel.